This could be one of the most important articles you’ll ever read. Why such a bold claim? Because 9 out of 10 struggling Internet Marketers have this problem and yet continue to ignore the solution and I don’t want you to be another statistic unless it’s because you are the 1 that does listen. I can’t tell you how many times I’ve heard a wealthy entrepreneur admit their rise to success did not begin until they stopped listening to all the people in their lives who were giving them bad advice. Sure, it’s difficult to grasp that your parents or uncle or your big brother might be a big reason why you’re struggling. It’s not their fault though. It was in their upbringing, too. It’s the way most of us are programmed. You probably already know what I’m talking about. Question is, are you ready to listen? Are you ready and willing to make some tough life choices and decisions so you can finally make that big ball & chain that’s been holding you back disappear forever? Because if you can’t, then you will never be able to climb the ladder of success. Let me clarify. If you are truly hungry for the money and the lifestyle that comes along with it, you have got to burn some bridges. You need to break ties with people who will never understand the entrepreneurial spirit. Those are all the people in your life who think the only good option is to get an education and then work for someone else for 40+ years. You know what? There are no billionaire employees. None. Not anywhere. I doubt there are any millionaire employees either. That’s one group of balls and chains. The other group is all the people you’re surrounding yourself with, online or offline, who don’t make anywhere near what you want to make but you’re still listening to them. Some of them anyway. You’re taking advice from the wrong people. Take a few minutes to watch this short video that my good friend Frank made recently as a live-stream on Facebook. Listen to what he’s saying. Let it sink in real good because this is life-changing stuff right here. Now look. Frank is a 7 figure earner. I am a 7 figure earner. Take a look around you and ask yourself who among those people are qualified to give you advice on becoming a 7 figure earner? How many of those people are employees trying to convince you that you cannot make anything of yourself unless you have a good job? Let me tell you a little story real quick. Way back when I first started dabbling in affiliate and network marketing, I had recently been laid off from my I.T. job as I was middle management and the company was cutting back big time. This was back in early 2001 when the economy really started taking a dump. I won’t get into all the details because it would take too long so I’m going to skip ahead a little bit. I had become an Ebay Power Seller and I had a business partner. This partner still worked for the company that laid me off and he was working with me during the evenings. I knew this guy my whole life because he was my Dad’s best friend growing up. Kind of like an uncle but not blood related. I had an enormous amount of respect for this guy for years because of the stories my Dad used to tell me about what a magical sales person he was. How he was constantly breaking company records, winning exotic trips and even had a big beautiful home paid for by his company because that’s how valuable he was to them. So here I am one day, sitting at my computer, working on some new Ebay product pages and I have this other window open where I’m reading up on some kind of affiliate thing called Clickbank. This guy calls me about something business related but I can’t remember what it was. I broke topic and told him how I was reading up on this guy who was making over $300 a day selling affiliate products a couple hours a day between dinner time and bedtime. I told him how I was going to do that, too, but I was going to make double that amount. In that instant, I lost any and all respect I ever had for the guy. I made an emotional decision to start trying to separate myself from him. This was long before I ever made any money online. But I knew even then that I was going to do this. I was going to make bank with Internet Marketing. I knew I would become a 7 figure earner and nobody was going to tell me otherwise. Not my family, not my friends, not my peers… nobody. It took me about 3 years from that time before I had finally learned enough to earn more than I did with my I.T. job. Then 2 years after that I had my first $80,000 month. Can you guess what it was that started turning things around for me? I refused to listen to anyone who wasn’t supportive and I never did anything for my business growth that didn’t come from some 6, 7 or 8 figure earner. The more success I had, the more wealthy marketers I went after. Not like stalking or anything like that. I sought out connections with people who made a lot more than I did. I listened to them and did my best to copy everything I saw them doing. If that last part sounds familiar to you, it should. That’s exactly what Tony Robbins says to do. He’s a smart guy and at least an 8 figure earner so listen to him, too. Look, my own Dad didn’t believe in me so I can definitely understand how difficult it can be to not listen to family members or allow them to sway you. I’m telling you, if you’re hungry for it, that’s what it takes. You can learn a lot from me with MasterMarketer.com. I’ll teach you as much as I can so keep coming back to see what’s new. I’m one 7 figure earner. Find a couple more and start modeling after them. Don’t try to reinvent the wheel. You don’t know better until you’re doing better than they are. I hope this blog post gets your engine running! Let me know in the comments below if you liked this one. Love it! I totally agree. 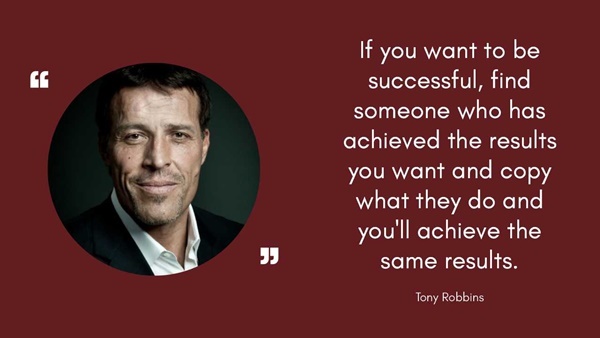 I really admire Tony Robbins and his life work.